In 1912, history was changed by the Miracle, when the old world of Europe was replaced by Darwinia, a strange land of nightmarish jungle and antediluvian monsters. To some, the Miracle was an act of divine retribution; to others, it is an opportunity to carve out a new empire. 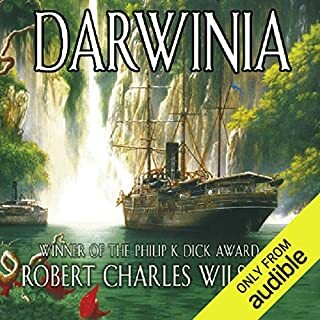 Leaving an America now ruled by religious fundamentalists, young Guilford Law travels to Darwinia on a mission of discovery that will take him further than he can possibly imagine. I thought it would be more about the discovery of that new land Darwinia, but it turned out to be a boring saga about something rather other.